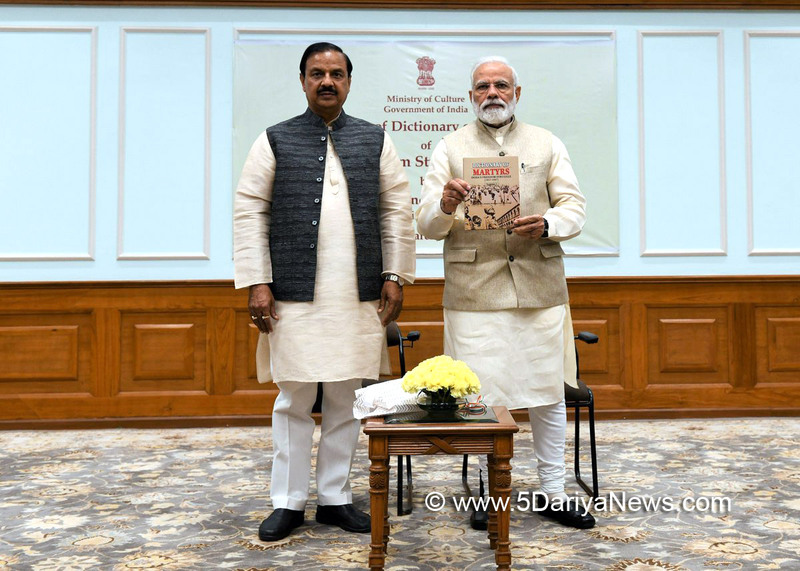 The Prime Minister, Narendra Modi, today released the Dictionary of Martyrs of India’s Freedom Struggle, at an event in Lok Kalyan Marg, New Delhi.Speaking on the occasion, he said this five-volume dictionary contains an account of the martyrs from India’s First War of Independence in 1857, to India’s Independence in 1947.He said that this includes the martyrs of the Jallianwala Bagh massacre, the non-cooperation movement, the Quit India Movement, and those soldiers of the Azad Hind Fauj, who attained martyrdom, among many others. He said that this was the first attempt at compiling the names of martyrs on this scale. He appreciated all those involved with the compilation, and the effort behind it.The Prime Minister asserted that a nation that does not honour and remember those who created, or are an important part, of its history, often does not have a secure future. In that sense, he added that this effort, is not just a way to cherish the past, but is also a way to secure the future. He said that youth should especially be made aware of this effort.The Prime Minister said that the effort of the Union Government is to nurture and recall the brave deeds of the heroes of our freedom struggle. He said this has a positive influence on the future generations, and inspires them to think of “India First.”The Prime Minister said that India, so far, did not have a war memorial since independence. He said that recently, he dedicated the National War Memorial, or Rashtriya Samar Smaarak, to the nation. Similarly, he said the National Police Memorial has also been built. He also mentioned the world’s tallest statue, the Statue of Unity, in honour of Sardar Vallabhbhai Patel. He said that in memory of Netaji Subhas Chandra Bose and the Azad Hind Fauj, the Kranti Mandir has been established at Red Fort. He said museums are also being built to commemorate the brave deeds of the Adivasi heroes who were part of our freedom struggle.The Union Minister of State for Culture (I/C) Dr. Mahesh Sharma was present on the occasion. The project for compilation of “Dictionary of Martyrs” of India’s Freedom Struggle was commissioned by the Ministry of Culture, to the Indian Council of Historical Research (ICHR) to commemorate the 150th anniversary of uprising of 1857.In this dictionary a martyr has been defined as a person who died or who was killed in action or in detention, or was awarded capital punishment while participating in the national movement for emancipation of India.It includes ex-INA or ex-military personnel who died fighting the British.It includes the martyrs of 1857 Uprising, Jallianwala Bagh Massacre (1919), Non-Cooperation Movement (1920-22), Civil Disobedience Movement (1930-34), Quit India Movement (1942-44), Revolutionary Movements (1915-34), Kissan Movements, Tribal Movements, Agitation for Responsible Government in the Princely States (Prajamandal), Indian National Army (INA, 1943-45), Royal Indian Navy Upsurge (RIN, 1946), etc. Information of about 13,500 martyrs has been recorded in these volumes. "Dictionary of Martyrs: India's Freedom Struggle (1857-1947)", Volume 1, Parts I & II. In this volume, more than 4400 martyrs of Delhi, Haryana, Punjab and Himachal Pradesh have been listed. "Dictionary of Martyrs: India's Freedom Struggle (1857-1947)", Volume 2, Parts I & II. In this volume more than 3500 martyrs of Uttar Pradesh, Uttarakhand, Madhya Pradesh, Chhattisgarh, Rajasthan and Jammu & Kashmir have been listed. "Dictionary of Martyrs: India's Freedom Struggle (1857-1947)", Volume 3. The number of martyrs covered in this volume is more than 1400. This volume covers the martyrs of Maharashtra, Gujarat and Sind. "Dictionary of Martyrs: India's Freedom Struggle (1857-1947)", Volume 4. The numbers of martyrs covered in this volume is more than 3300. This volume covers the martyrs of Bengal, Bihar, Jharkhand, Odisha, Assam, Arunachal Pradesh, Manipur, Meghalaya, Nagaland and Tripura. Dictionary of Martyrs: India's Freedom Struggle (1857-1947)", Volume 5. The number of martyrs covered in this volume is more than 1450. This volume covers the martyrs of Andhra Pradesh, Telangana, Karnataka, Tamil Nadu and Kerala.